← Does Anyone Else Constantly Pause Movies to Check Things on Wikipedia? 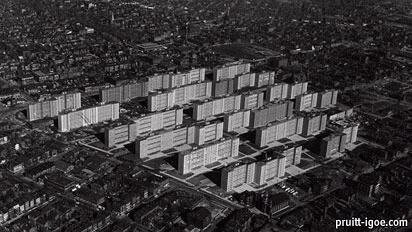 The Pruitt-Igoe housing project consisted of 33 eleven-story buildings in inner St. Louis. Its residents were exclusively black and low-income, the remnants of a major slum-clearance effort after World War II. The project was built quickly, with a relatively small budget, and included some architectural innovations like elevators that only stopped every three floors and ‘galleries’ where residents could hang out and get to know each other. The rest of the story is familiar to anyone who has even a passing familiarity with American urban policy in the last four decades. As inner-city residents increasingly moved out to the suburbs, demand for project-housing plummeted, and the tower blocks steadily emptied until only the poorest, least mobile and unemployed-est residents remained. Since its demolition in 1972, Pruitt-Igoe has become shorthand for socially pioneering architects building public housing totally out of sync with the needs of residents. Pruitt-Igoe’s long corridors and forced-hangout spaces became mugging spots. The ‘open plan’ lobbies allowed people to enter the buildings who didn’t live there, which lessened residents’ feeling of ownership over the buildings. That’s the conventional wisdom, anyway. This article is a fascinating unpacking of this myth, and shos that the architects, far from being social crusaders or blind to residents’ needs, were simply so constrained by the site, necessities and budget of the project that they had no ability to construct decent living spaces. It was the city’s decision to concentrate its poorest residents in tower blocks, the city’s decision to underfund construction materials and consultation, the city’s decision to neglect maintenance, the city’s decision to fail to implement education or jobs programs for Pruitt-Igoe residents. In other words, the Pruitt-Igoe projects didn’t fail because they were poorly designed, they failed because they were poorly conceived. Pruitt-Igoe was shaped by the strategies of ghetto containment and inner-city revitalization—strategies that did not emanate from the architects, but rather from the system in which they practice. The Pruitt-Igoe myth therefore not only inflates the power of the architect to effect social change, but it masks the extent to which the profession is implicated, inextricably, in structures and practices that it is powerless to change. Simultaneously with its function of promoting the power of the architect, the myth serves to disguise the actual purpose and implication of public housing by diverting the debate to the question of design. By continuing to promote architectural solutions to what are fundamentally problems of class and race, the myth conceals the complete inadequacy of contemporary public housing policy. It has quite usefully shifted the blame from the sources of housing policy and placed it on the design professions. By furthering this misconception, the myth disguises the causes of the failure of public housing, and also ensures the continued participation of the architecture profession in token and palliative efforts to address the problem of poverty inAmerica. The myth is a mystification that benefits everyone involved, except those to whom public housing programs are supposedly directed. There’s a movie coming out about it! Especially the WIN/FAIL blaming the architects as all-powerful losers – if only they’d designed the buildings better it all would have worked, despite the fact that the whole enterprise was doomed for lack of funds, lack of follow-through, and lack of a vision of what it would look like if it worked. That movie was awesome. Saw it here in St. Louis, and they had a few of the residents on hand to speak about their experiences growing up in Pruitt-Igoe. Fascinating.